I drove to Lac du Bonnet today. That took me past Clearwater Bay, and from the highway it looks completely frozen, but maybe a little grey. At Pye’s Landing, it seemed as if ice was melting away from some of the docks, but I didn’t see enough water to drive a boat in. I don’t think today’s rainfall in Kenora amounted to much, but it was cloudy enough to block the satellite’s view of Lake of the Woods. Yesterday was no good either. The most recent sharp pictures were on Thursday the 18th. Here are the MODIS camera images from the Terra satellite. On the false-colour image, you can really see what an important factor current is. The Rainy River at the south end, and the Winnipeg River at the north are both wide open. All the other dark water is at narrows in one location or another. It looks as if the ice is darkening on the north portion of the lake more than on Big Traverse in the south. Here’s the same photograph in natural colour. 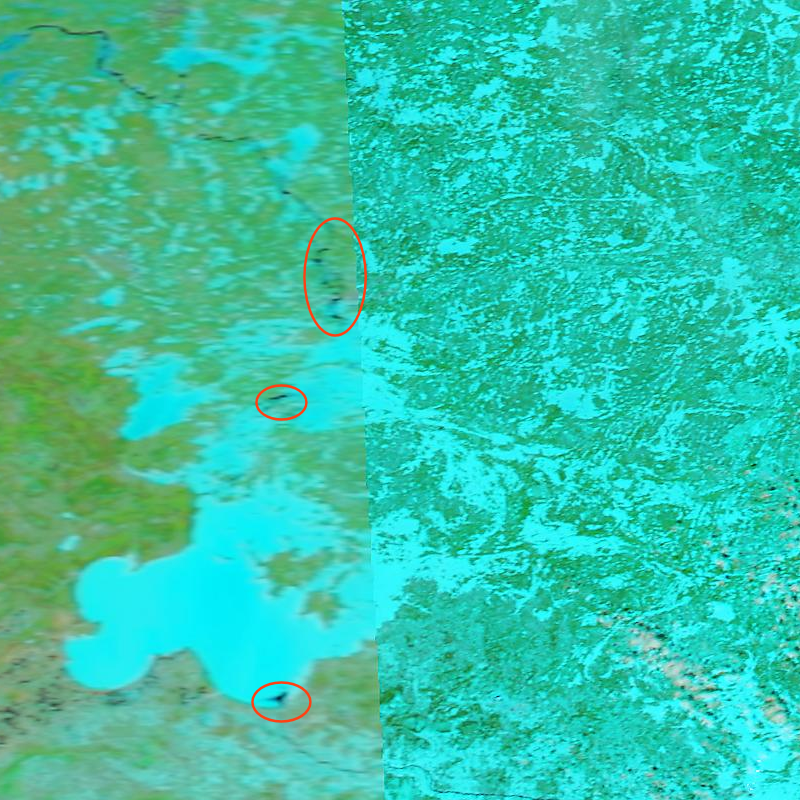 It’s much harder to distinguish water from islands, but the difference in ice quality from north to south is clear. For fun, here’s a comparable shot from the same date one year ago. It looks to me as if we’re pulling ahead. We should be: today’s high was 15ºC, and our recent string of double-digit daytime highs is about a week earlier than a similar jump in temperatures a year ago. If you thought this spring was cold, on April 13th of 2018, the overnight low was -10ºC, and the daytime high was -1ºC! By the way, if you’re having trouble figuring out which is your favourite part of the lake, here’s a similar picture from the FAQ with some key features marked. 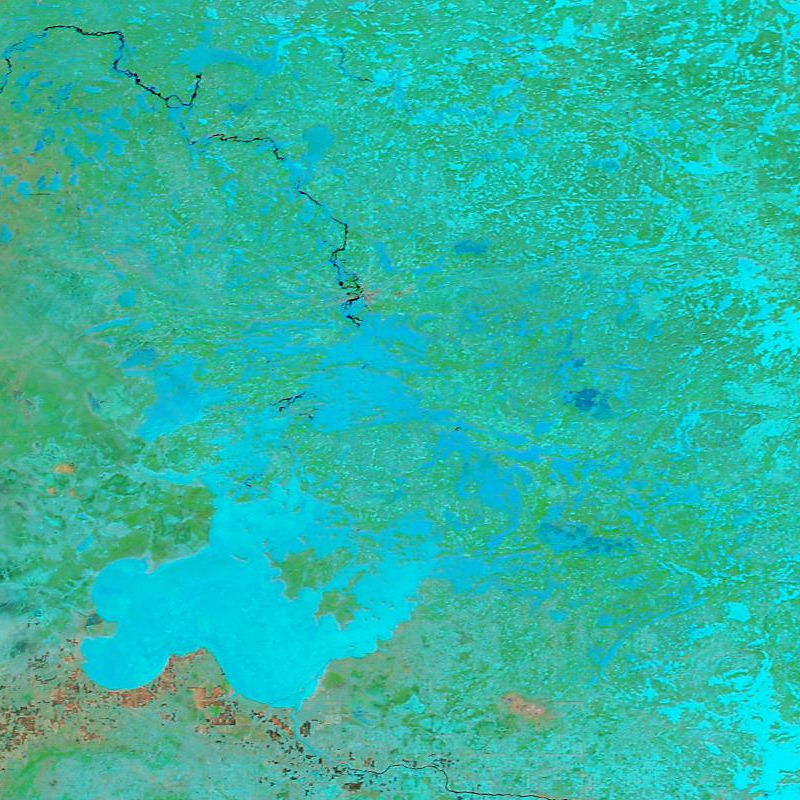 The MODIS camera images from NASA’s Aqua and Terra satellites are used with permission from Liam Gumley, of the Space Science and Engineering Center at the University of Wisconsin-Madison. I haven’t flown for a little while. Thursday’s flight tests* were postponed because someone got sick, and Friday’s trip was cancelled due to heavy fog in the morning. *Commercial pilots do quite a lot of training every year. For each type of plane we fly, there’s ground school and exams, flight training and a flight test where we deal with simulated emergencies and field questions from the examiner. In addition to my own two annual ‘rides’ [MAG Canada operates two different models of King Air, and I fly both] I also participate in training flights and rides for several other pilots. 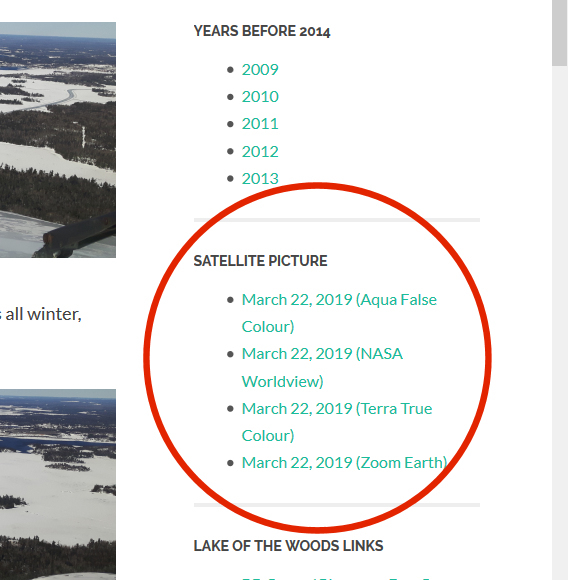 The weather’s been cloudy lately, but skies cleared early enough today for cameras on both Terra and Aqua satellites to get fresh images of Lake of the Woods. Both shots are a little blurry. 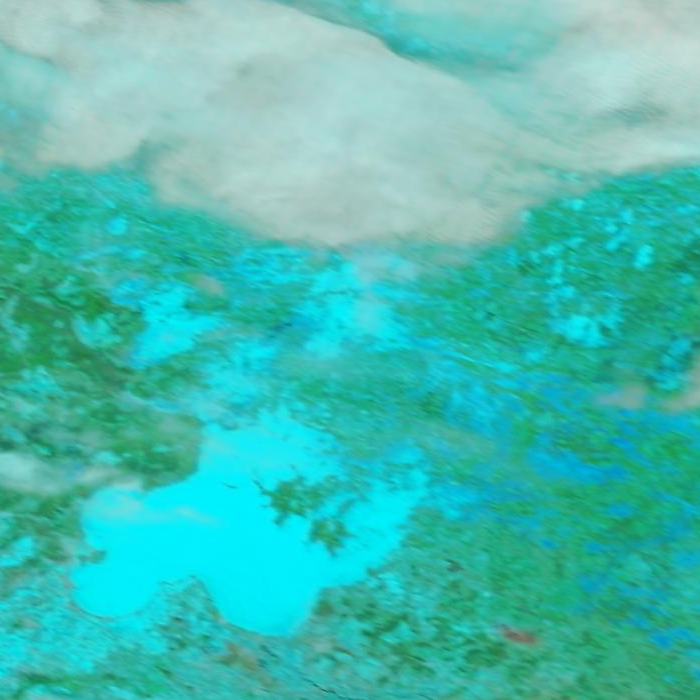 In the Aqua satellite’s false colour image above, you can see a wiggly black line in the upper part of the frame. That’s the open water on the Winnipeg River and it’s almost continuous from Kenora to Minaki. Another change is close to the center of the picture: open water is expanding in Big Narrows, and surrounding ice conditions look darker there over quite a large area. 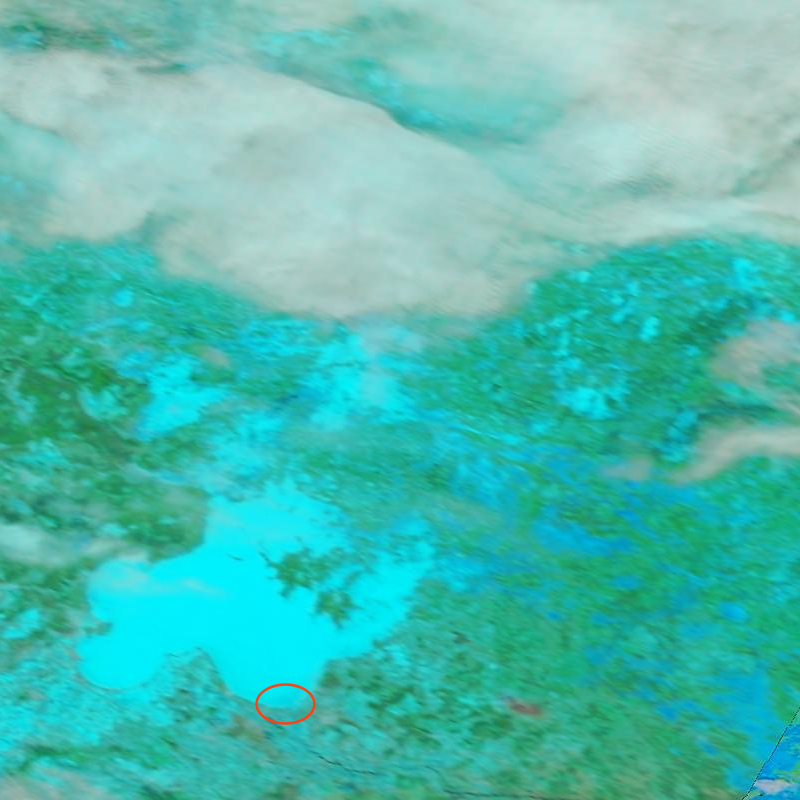 There was more cloud cover when Terra took a shot, but both satellites show ice in a darker shade around the Whitefish Bay area near Sioux Narrows at the lower right of the frame. That should represent a large area of weakening ice or at least ice with less snow cover. This is probably partly due to the rain we had yesterday. All the links under the Satellite Pictures heading have been updated, so if you’d like to see the same pictures in Natural colour, you can visit the University of Wisconsin’s site to see that and other options. 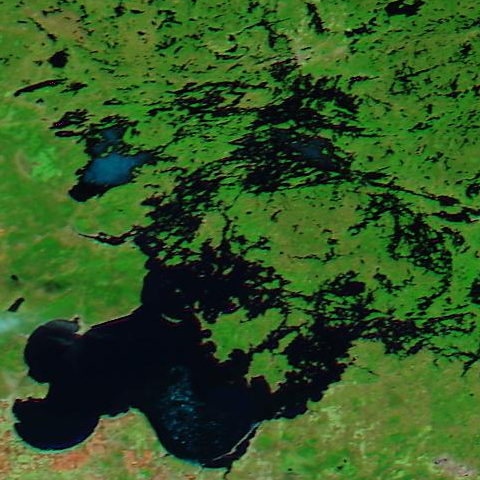 The MODIS cameras on NASA’s Terra and Aqua satellites deliver both natural and false colour images, and the USA3 compilations encompass a huge swath of Canada from Lake of the Woods to the Great Lakes. It’s been too cloudy to produce any clear satellite images since the 27th, but what we can do is look back to see how this March compares to the same time in previous years. First, let’s get oriented. Here’s a similar picture from later in the spring that I marked up with some place names. Now to business. Here are a set of false colour images from the end of March. The false colour looks weird, but it gives the most contrast between ice and water. 2018 is in there because of the similarities to this year. 2017 was a mild, early spring. 2014 was an exceptionally cold, late thaw. The black squiggles near the top of each frame are open water on the Winnipeg River. Near the middle of the pictures you can sometimes pick out water at Big Narrows. 2019 and 2018 are a close match, but I think this year’s going a little better. Also, there’s a three day difference in the dates, because some days were too cloudy for satellite shots. The bottom pair show the range of conditions you can see at this time of year. 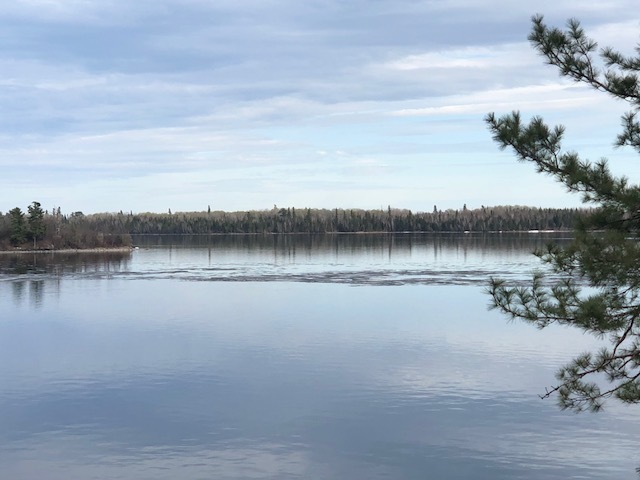 2017 was mild: by late March the Winnipeg River was almost entirely open, and the Rainy River was opening things up at the south end of the lake. Ice-out that year was in late April. On the other hand, 2014 was unusually bitter, and there was hardly any open water at all. In fact, Lake Superior (not shown) was 90% frozen, which is wild for the end of March. 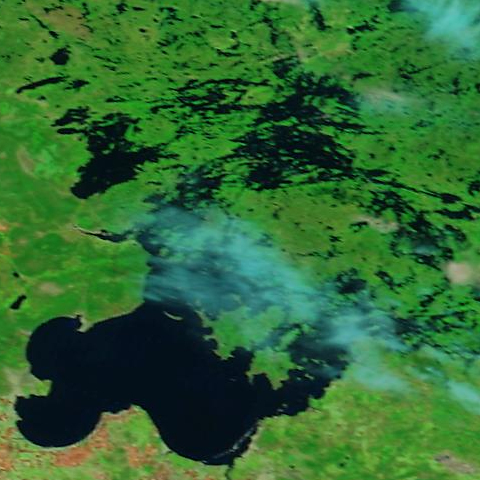 Lake of the Woods wasn’t ice free until May 21st that year. Thanks to Liam Gumley, of the Space Science and Engineering Center at the University of Wisconsin-Madison for permission to crop, annotate and use these pictures. What does all this mean for this year? It means we’re doing about average. Yes, things look a lot like 2018, and that was a late spring. But it was late mainly because of a nasty stretch of frigid weather in Late April and early May. That shouldn’t happen this year. The first few days of April will be below normal, but as we head into the second week of April, temperatures should swing up, and at least one forecast says we might see shirtsleeve temperatures by the middle of the month. Let’s hope that prediction holds up. I don’t often fly on Saturdays, so this is a great chance to catch up on the Satellite pictures. The MODIS camera on NASA’s Terra satellite got a nice sharp picture yesterday. The first thing you’ll notice is that this picture looks like it’s in black and white. It’s not. There just isn’t a lot of sparkling blue water or green leaves at this time of year. Need a little help getting oriented? You won’t find your house on this picture: the smallest identifiable features are lakes about the size of Kenora’s Rabbit Lake, Round Lake and Laurenson’s Lake. All three are inside the little red circle. 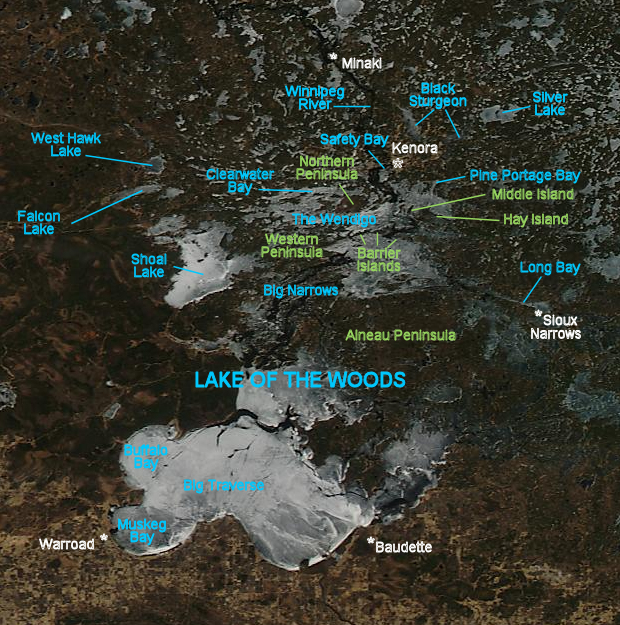 Gives you an idea of the size of Lake of the Woods, doesn’t it? No, you can’t zoom in to see more detail. This is the highest resolution shot the MODIS camera gives us. Here’s an old picture of the lake with more features marked. The picture above is also on the FAQ page, if you’d like to refer to it later in the season. It won’t always work out that a clear satellite picture shows up just in time for a Saturday Ice Patrol post. Sometimes it’s too cloudy, sometimes the pictures are blurred. But I try to update the links at the right after a clear day. Each link shows the date, so you don’t have to click on it if it’s old news. Here’s a picture of what to look for, but the picture does not have live links. If you can’t find this block of links, it may be because you’re looking at an email instead of the icepatrol.ca website, or it may be because the mobile version moves the links to the bottom instead of the side. Once you visit the satellite pictures at their own websites, it’s not too hard to change the dates. I’ll have another new weekly feature starting tomorrow, and I should be flying on Monday, so I hope take some fresh pictures then. Just a handful of icy loose ends remain to tidy up. 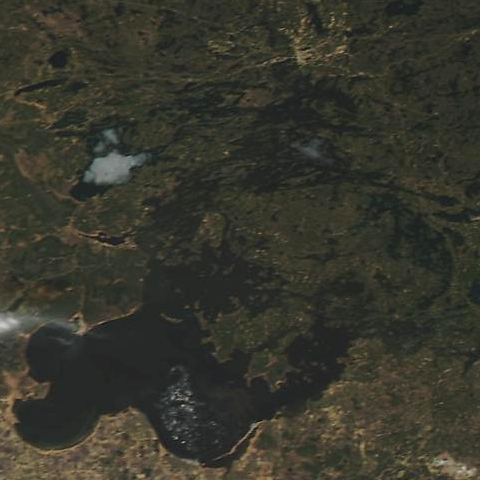 Cloud layers in the Sioux Lookout area prevented me (and the satellites) from seeing Lac Seoul today, but skies were mainly clear when I returned to Kenora this afternoon. I took a look at Shoal Lake from a distance, and I couldn’t see any tell-tale whiteness. Satellite pictures also show it entirely dark now, so I don’t think there’s any ice left. Here’s the false-colour image from Terra Satellite. The turquoise blur south of the Alneau Peninsula is just thin cloud. 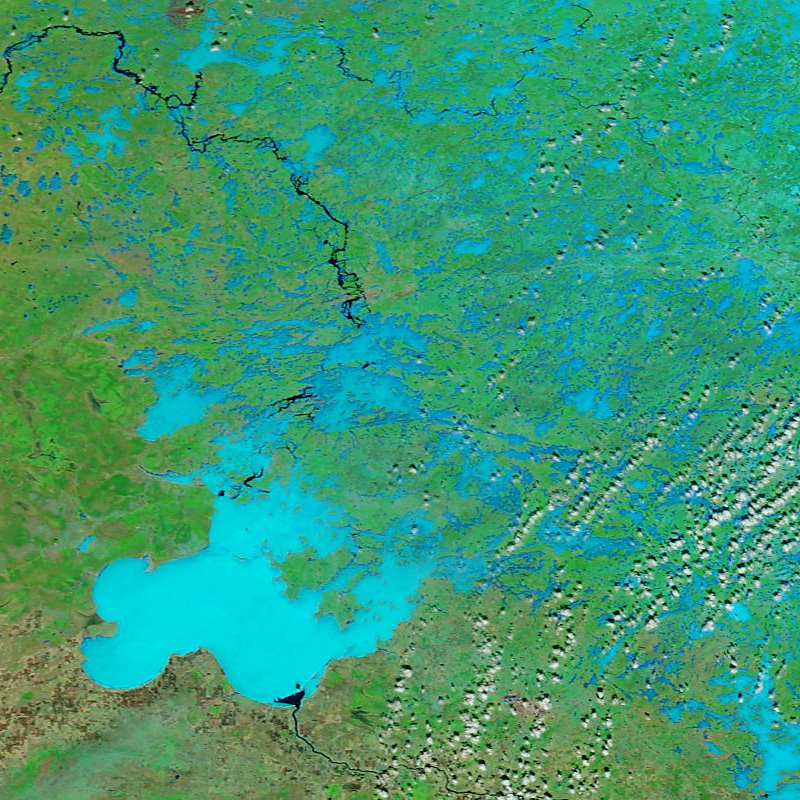 Shoal Lake is the vaguely heart-shaped lake in the upper left quarter of the picture. In the meantime, I’d like to warn you that from the air, I’m seeing extensive “beaches,” not just on Lake of the Woods, but on all the lakes, a sure sign of very low water levels across the region. Please be careful with your boat, I’m already hearing that the marina mechanics are seeing a lot of bottom-end damage coming in. Approach reefs and shorelines, even at your own property, with extra caution this year. Time for my annual reminder that float planes have the right of way over boats when landing or taking off. Be especially alert around Kenora’s Safety Bay, which is a licenced water aerodrome. 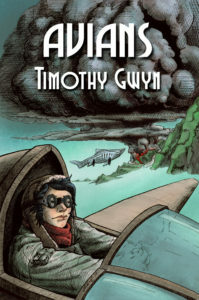 Eyes on the skies, please, and check over your shoulder- float planes are fast! Tomorrow I’ll be flying into Red Lake, so I’ll take a look at Red and Trout Lakes. I expect Red to be clear of ice, but Trout might still have some left. That’ll be about it for the region. Have a great summer! Ice on Lake of the Woods continues to melt away. Devon Ostir took this picture of the last scraps of ice on the Manitou yesterday, near Wolf Island and Hare Island. This morning he reports it is all gone. Satellite imagery confirms that ice is vanishing. Here’s Saturday’s picture from the Aqua’s MODIS camera in true colour. 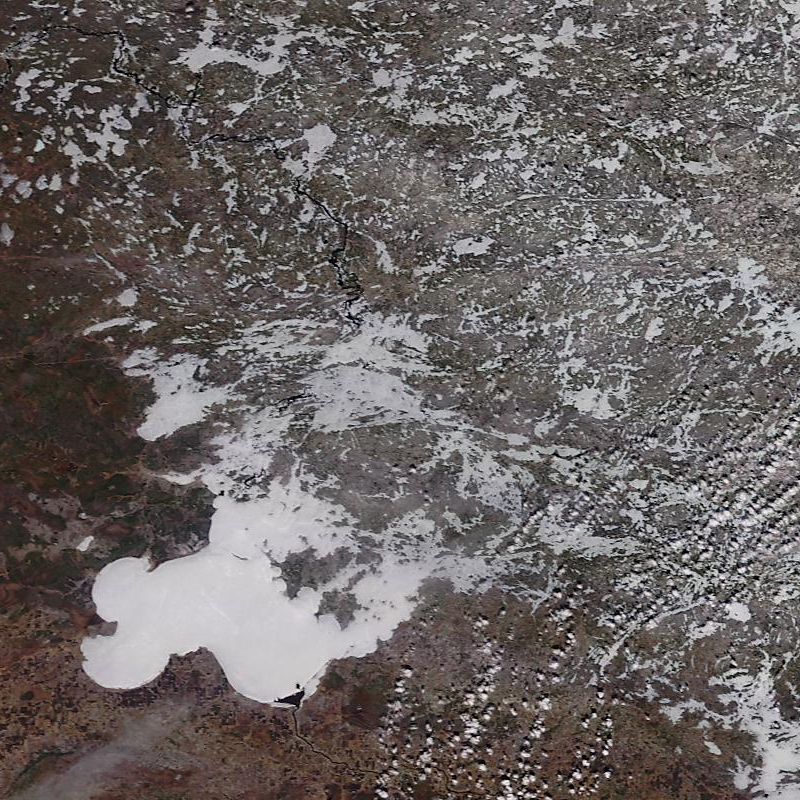 Shoal Lake has significant ice, but on Lake of the Woods, the patch south of the Barrier Islands is fading fast. The sheet of ice at the south end, near Baudette, is both bigger and whiter, but it looks very fractured, and wave action in that huge expanse of open water will probably make short work of it. Here’s the false-colour version of the same image. The ice actually shows less clearly in the artificially filtered scheme. Ice in the last stages of melting (see an old post about candling here) always looks the same as water in the false-colour images. The weekend should stay sunny, breezy and warm, with temperatures at or above normal. If the remaining ice on Lake of the Woods lasts through Sunday, I expect it will vanish on Monday. I’ve already got my year-end graphs ready to go. Shoal Lake might take a day or two longer.